Held back by the Wolf Creek dam which was constructed by the Army Corps of Engineers in 1952 on the Cumberland River, the dam provides flood control and hydroelectric power to the surrounding valley. Construction of the dam brought tourism to the area, and Lake Cumberland has been an economic engine ever since. Almost five million people visit Lake Cumberland each year, and the lake is home to over one thousand permanent houseboats, with rental houseboats available to visitors. Houseboating a little to slow for you? Rent a powerful ski boat or personal watercraft and see all of the lake’s 102 square miles in style. Waterskiing isn’t the only form of recreation available on the lake. Fisherman delight in the abundant population of gamefish. Many Kentucky state records have been set here by anglers including brown trout, rainbow trout, sauger, striped bass, lake trout, sturgeon, and walleye. Take time to grill up the catch of the day at one of Lake Cumberland’s many parks and enjoy the picnic benches, barbecue grills, and shade trees. 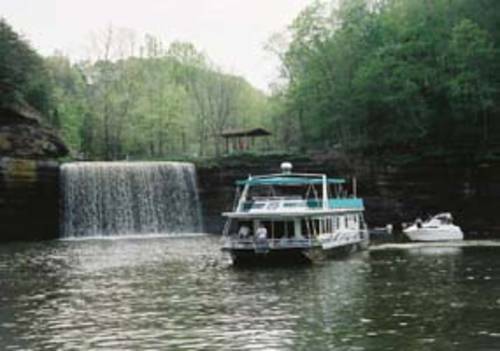 Lake Cumberland Resort Park and General Burnside State Park are both administered by the State Parks Service. Jamestown is conveniently situated by Cumberland Plateau, a great place to get away from it all! Jamestown Resort Lodging has a wide range of options to stay at, including all-suite lodging to guest cabins.